On July 1st, 2018, Fr. George Aguilera began his tenure as the newly appointed Pastor of St. Anthony Parish. Formerly, he served as Pastor of another St. Anthony’s – St. Anthony of Padua Parish in Gardena. He was born in Los Angeles and grew up in the Boyle Heights neighborhood, attending Our Lady Queen of Angels Catholic School and St. John’s Seminary. Fr. George has been a priest for 35 years. 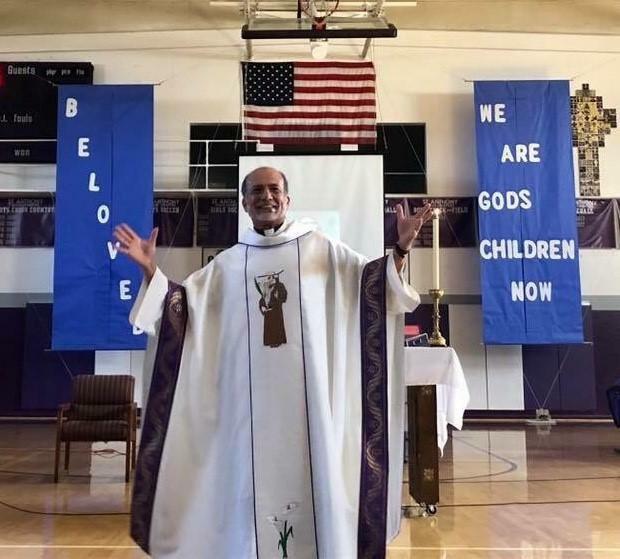 On July 2nd, St. Anthony High School welcomed Fr. George on campus for the first time. This visit proved to be the first of many enjoyed by our entire school community over the coming weeks and months. During his brief time as Pastor of this historic Long Beach Parish, Fr. George has inspired us all with his vision of unity and shared mission, serving God and our entire community. According to Fr. George, “When I began my assignment as Pastor of Saint Anthony Church, I was eager to listen to parishioners and become acquainted with their stories. I soon learned the history of the Parish and the influence that St. Anthony High School has played on the lives of its alumni and families. “One cannot speak of Saint Anthony Parish without mentioning St. Anthony High School. For many alumni, whether they reside in the Parish or not, the two are inseparable. Several alumni approached me with a familiarity that is grounded in a good positive experience with St. Anthony High School. They feel I am their Priest. This is my vision for our High School. Welcome, Fr. George Aguilera! You are a Saint!